I have set this scene at mid day. The sun is overhead in this scene. Moses, Joshua (son of Nun & assistant to Moses), flanked by two other Hebrew leaders. Moses, Joshua (son of Nun & assistant to Moses), two Hebrew leaders. This scene was commissioned by a sports ministry company. 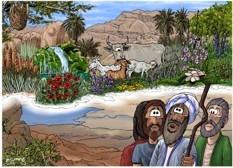 I wanted to illustrate the difference between the desert side of the Jordan river & the Promised Land side. I have used warm yellows & browns in the sandy, bare rocks beneath the feet of the figures. This represents the sun-baked desert region that the Hebrew people had been wandering around in for the past forty years. You can see the Jordan River, which is in full flood, though it is difficult to make that out at this distance, since the river is about 10 miles away from Mt Nebo where the figures are. The river Jordan is the border between the desert side & the Promised Land beyond. We know the River was in flood from Joshua chapter 3 verse 15. Having calculated the distances from the top of Mount Nebo to various points mentioned in the text above (see  below), I have concluded that Moses couldn’t have seen all of the Promised land with his natural eyesight. Either the curvature of the earth, or intervening mountains, hills & land would have blocked his view, particularly north (towards the sea of Galilee & beyond) & south (towards the village of Zoar/Bela & the Negev desert beyond). Of course I am not about to contradicting the Bible! The fact that Moses could not see all of the Promised land with his natural, physical eyes, simply means that the Lord must have given Moses a supernatural view; a vision picture in his mind, of the full extent of the Promised land. I wanted to show Moses’ expression as being both wonder-filled & awe-struck. Joshua & the two other Hebrew leaders are not able to see the vision that Moses sees. The bottom half of the scene is the physical landscape that everyone present can see, but the top of the scene, with colourful flowers, plants, landscape & animals represents Moses’ vision of the Promised land. The top part is separated from the bottom half by a pale white wispy mist, which is my way of defining that part of the scene which is vision picture & that part which is not. The Promised land is described as a land flowing with milk & honey (Exodus 3:8), so naturally I have included a cow in the centre of the scene (milk) & a swarm of bees in a tree in the top left (honey)! Apis florea (aka dwarf honey bee, red dwarf honey bee) – the bee globe in the tree in the top left of the scene. (aka Aloe barbadensis, Aloe vulgaris, Medicinal aloe, Bitter Aloe) – A blue/green leaved succulent plant which grows 24–39 inches (60–100 cm) tall, with white or yellow serrated leaf edges, growing in dry, desert environments. These ones have orange flower stalks up to 90cm tall, which flower in April & May. 6000 year old stone carvings in Egypt contain images of this plant, which they referred to as the “plant of immortality”. The bright red flower, with black centres, in the left foreground is Adonis microcarpa (aka Small pheasant’s eye, Red Chamomile) a common Mediterranean annual, the flowers having 5-8 bright red petals. The plant grows up to 24 inches (60cm) high. Sometimes it appears in carpets of green & red flowers around lake Kinneret (The sea of Galilee), flowering February-April. Another carpet of this striking red flowered plant can be seen on the extreme right of this scene. The purple flower in front of the goats is Campanula rapunculus (aka rampion bellflower, rampion, or rover bellflower) which reaches an average height of 16–31 inches (40–80 centimetres), with a maximum of 39 in (100 centimetres.) The stem is lightly hairy, upright & branched on the top. Flowers appear from April to June. This species prefers limestone soils and grows wild in dry meadows, forests of oaks and pine trees & by roadsides. It inhabits altitudes of 0–4,921 ft (0–1,500 metres) above sea level. The yellow flowering plant in front of the goats in the foreground is Tragopogon buphthalmoides (possibly having the common name goatsbeard) is a common tuberous perennial herb found in the Mt Hermon & Golan regions & in the Judean wilderness. This is one of the shorter stemmed plants which bloom in June-July. Used as a food additive with some imputed health effects in folk medicine of western Iran. Vicia tenuifolia (aka Fine-leaved vetch) is a common Mediterranean perennial herb, with pink to violet flowers growing on stems up to 39inches (100 cm) tall. Flowers April-June, in May it blooms in the northern part of Israel. This plant is one of the 140 species of plant in the vetch (legume) family (Fabaceae). Bitter vetch (Vicia. ervilia) was one of the first domesticated crops, grown in the Near East about 9,500 years ago. Another well known species is Vicia faba (the broad bean.) Among the closest living relatives of vetches are the lentils (Lens) and the true peas (Pisum). Alcea setosa (aka Bristly holyhock) are impressively tall plants, up to 8.2 feet (2.5 metres) tall. The whole plant is bristly, hence its common name. The plant flowers from April – June. In the Galilee & Carmel regions, the flowers are darker pink, whilst in the Gilboa, Judea and Samaria regions they are lighter in colour. The flower’s name is “Khatamit Zifanit” in Hebrew. In folk medicine, the liquid of the plant is used to treat coughs, inflammation & injuries such as burns. Juglans regia (aka English walnut, Persian walnut, Common walnut) is the large tree growing on the far right side of the scene. The tree can reach a height of about 115 feet (35 metres) and a diameter of 6.5 feet (2 metres) at breast height. These trees can reach an age of over 100 years & are grown for their nut harvest & as ornamental trees. The species originates from temperate savannahs at altitudes between 3280-6562 feet (1000 -2000 metres), across almost all of Asia. The wood of common walnut is hard and resistant and used for making furniture. In Israel, where extensive irrigation is needed in the summer, walnuts grow in the Galilee and the Golan. In front of the Walnut tree is a deep blue flowering plant, Salvia indica (aka Blue sage), which is a tall plant, exceeding 59 inches (150 cm) in height. The native habitat of Salvia indica includes rocky limestone slopes between 350 to 5,000 ft (110 to 1,520 m) in elevation, where it flowers in April and May. It is quite rare, found in a few locations in the Upper Galilee and the Golan Heights, here at elevations over 2625 feet (800 metres) above sea level. The plant displays all stages of development of the flower from the buds to the withering flower at once. Whilst rare in Israel, it is native to a wide region of Western Asia that also includes Iraq, Iran and Turkey. There is evidence that the extracts of this plant have some medicinal (anti-fungal) qualities. How far could Moses see from the top of mount Nebo? Illustrated Bible Dictionary: And Treasury of Biblical History, Biography, Geography, Doctrine, and Literature. You could see 67.88 miles (109 Km) distance from the highest point on Mt. Nebo, assuming there are no mountains blocking your view! This calculation suggests that Moses could not naturally see (ie just with his eyes) the whole extent of the Promised land.